Filled with rugged Pacific Northwest mountain terrain that encircles one of the country’s most majestic and beautiful lakes, Oregon’s Crater Lake National Park is the home of the annual running of the Crater Lake Rim Runs Marathon, Half Marathon & 6.7-Mile Run/Walk, which takes participants around the rim of Crater Lake at altitudes ranging from 5,980 to 7,850 feet above sea level. This challenging, high-elevation run promises breathtaking views along with a relatively small and intimate race field size, as the event is limited to 500 entrants for all three races combined. The 13-mile half marathon starts at the area of the park known as The Watchman, and follows a route around the north rim of the park, passing by and through areas, rocks and peaks including Hillman Peak, North Junction, Cleetwood Cove, Mazama Rock (which overlooks Rugged Crest on the northeast stretch of the rim), Round Top, Wineglass and finishes roughly a mile away from the rim overlooking the lake, at the area known as Scotts Bluff. The early stretches of the race feature climbs of roughly 50 feet around Hillman followed by drops of nearly 400 feet by the time runners reach North Junction, as well as big climbs near the end of the race, where the route climbs 400 feet around Skull Head and just over 530 feet toward the finish at Scotts Bluff. While these hills, drops and climbs in elevation are often daunting, past runners who’ve taken part in the race say that the scenery more than takes their mind off the pain. At 1,943 feet in depth, Crater Lake is the deepest lake in the United States and is filled with crystal-blue water thanks to runoff from the heavy snows and rains it receives from October through June every year. It’s also unlike any other natural scenery you’ll find anywhere else in the country, as it was carved roughly 7,700 years ago by the collapse of Mount Mazama, which once stood 12,000 feet high in this area and collapsed in a violent eruption of the caldera volcano underneath. Bus transportation is provided to the starting line for all participants, and those who are lodging in or near the park for the race are invited to a viewing of “The Rim and Its Runners,” a video introduction that is shown the Friday night of the race weekend. Located just over 50 miles by car from the southwestern Oregon town of Klamath Falls, Crater Lake National Park is perhaps most famous for being the spot that receives the heaviest snowfall anywhere in the U.S., with an average of 533 inches of snow every year. In the summer when the race is run, however, weather conditions are usually mild to warm, and sometimes August temperatures even reach the 90s. 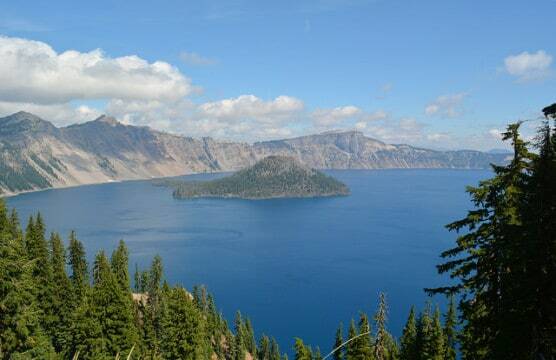 See the race route map for the Crater Lake Rim Runs Half Marathon here. To reserve your spot in the 2019 running of the Crater Lake Rim Runs Marathon, Half Marathon or 6.7-mile run or walk, visit the event website below. Ever run in the Crater Lake Rim Runs? Share your impressions here, or post your review in the Comments below. We target the Seattle and Portland/Bend of outdoor recreational enthusiasts. Would you like any advertising information? Our Summer edition deadline is June 16.